Naigra Cast Iron Submersible motor specially designed, with the latest manufacturing techniques. years of experience superioor design and better manufacturing have resulted into development of this range of motor which are efficient and relaible in operation. strict quality assurance during the total process assure trouble free and reliability in peration requiring minimum maintenance. Motor Shaft is SS420 grade or above. Corrosion resistant stainless steel stator Shell. Winding wire poly propylene with insulation class - B.
Flange and Shaft protrusion as per NEMA Standard. water lubricated redial and thrust bearing. Mounting : Vertical / Horizontal. Single Phase motors are capacitors start capacitor run. solid copper bars inserted in to our piece billet rotor offer great rigidity. Rotation : Clockwise when viwed from motor end. Single Phase 2.2 kw to 5.5 kw (3 hp to 7.5 HP) 220-230 Volt/ 50 Hz. NAIGRA V8 Submersible motor specially designed, with the latest manufacturing techniques. Years of experience, superior design and better manufacturing have resulted into development of this range of motor. Which are efficient and reliable in operation. Strict quality assurance during the total process assure trouble free and reliability in operation requiring minimum maintenance. Built for coupling with submersible multistage high and low load thrust 6” pumps for clean water deep well. 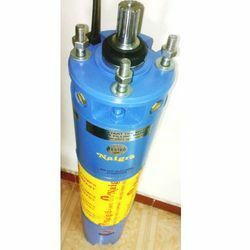 8” NAIGRA Water Lubricated Motor are rewindable. Upper/Lower bracket and Motor base are cast iron with nickel coating. Motor shaft is of SS 420 grade or above. Stator shell is of 304. Winding wire poly propylene with insulation Class-B. Water lubricated radial and thrust bearing. Single phase motors are capacitor start capacitor run. Maximum allowable rating voltage fluctuation +6%-10%. Three phase 5.5 kw to 37.5 kw, 380-400 Volts / 50 Hz. NAIGRA Submersible motor specially designed, with the latest manufacturing techniques. Years of experience, superior design and better manufacturing have resulted into development of this range of motor. Which are efficient and reliable in operation. Strict quality assurance during the total process assure trouble free and reliability in operation requiring minimum maintenance. 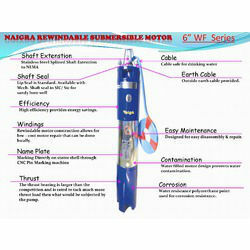 NAIGRA Water Lubricated Motor are rewindable. Single phase 2.2 Kw to 5.5 kW, 220-230 Volt / 50 Hz. Three phase 2.2 kw to 37.5 kw, 380-400 Volts / 50 Hz.